A friend of mine asked me to try it a couple of years ago. I thought it would be way too extreme for me. Last summer, my son suggested it. I had noticed 515 while visiting Hope. Finally, nothing like a free trial to seal the deal. First and foremost, I was resigning to the idea that I would never get in shape. My thinking was that I had bad genetics and there just wasn’t a viable program to counter the forces of nature that were affecting me physically. My previous attempts to get in shape all lasted about 6-8 weeks. They weren’t effective or sustainable. I had nearly given up all hope. Second, and I think this is going to prove to be just a little blip on the screen, the workouts led to the discovery of a few tumors hiding out in my bladder. I am positive that if I had continued doing what I was doing before 515, we would not have found them. As it is, I’m confident that in a few months it will be just a wee memory. I am eagerly anticipating continued physical improvement and the challenging WODs 515 has in store. What’s more, being part of the 515 community is awesome. There is so much encouragement and support. Within 5 minutes of my first visit to 515 members were introducing themselves and welcoming me. That’s the bonus – the relationships. I’ve made, and continue to make new friends at 515. Each morning, I look forward to the workouts and being part of a positive thriving mentally tough group of people striving to be their best. At this point my vision is to be working out at 515 when Bobby is my current age: 55 (seriously). My least favorite is the overhead squat. How can such a small amount of weight be so hard to control? I had 4 (now 3) brothers. Back in the day I had hair halfway down my back, a full beard and I drove a metallic black 1978 Z28 Camaro. My favorite TV show is Breaking Bad. I watched all 62 episodes inside three weeks. My favorite movie is “Facing the Giants.” My wife and I have watched it at least 8 times. I bet it had been 20 years since I had completed a standard dead hang pull-up. 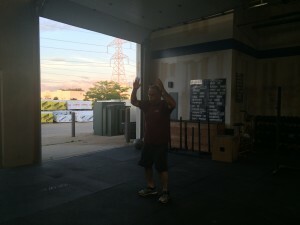 So two months into CrossFit when I pulled off three I was in shock. The goal is 10 by the end of the year. Congrats, Mark! Lots of awesome ^^ in there. It’s good to have guys with vision at 515 – sign me up for the 30 year plan as well. Boom! You are so amazing and positive. I enjoy having you as one of the “silverbacks” at 515. Looking forward to seeing you back on a daily basis. Congrats, Mark! Love your attitude.